The country's near-term future may be uncertain, but these three companies should continue to do well in almost any political environment. In a stunning upset, America has elected Donald Trump the 45th president of the United States. The news caught the markets off guard, sending stock futures plummeting overnight. They've since recovered, but many investors are left wondering what a Trump presidency means for the economy. I very frequently get the question: "What's going to change in the next 10 years?" And that is a very interesting question; it's a very common one. I almost never get the question: "What's not going to change in the next 10 years?" And I submit to you that that second question is actually the more important of the two -- because you can build a business strategy around the things that are stable in time. Applying this quote to the investing world, I asked myself what trends are likely to not going change over the next four years, even with Trump taking over the White House. Here are three that came to mind. Like it or not, Americans are still going to produce mountains of trash over the next four years. That means we're going to remain heavily reliant on companies that haul garbage to keep our streets clean, so the leaders in the waste-hauling space are likely to be unaffected by the political shift. 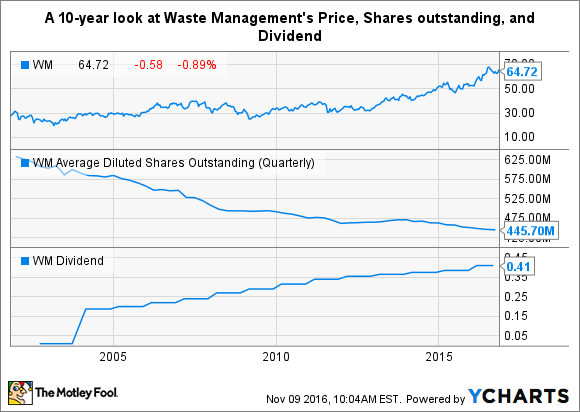 That fact bodes well for Waste Management (NYSE:WM), the largest trash hauler in the country. This company counts more than 21 million customers throughout North America, which gives it huge scale over its rivals. Better yet, trash collection is a monopoly-like business, so the company should have no problem continuing its long history of cranking out cash flow and rewarding long-term shareholders. The hit-driven nature of the movie business will always ebb and flow, but consumer demand for a high-quality theater experience has consistently grown for years on end. That's greatly benefiting IMAX (NYSE:IMAX), as movie theater owners have been in a mad dash to install the company's supersized screens in their cinemas, in an effort to offer a better entertainment experience. We saw this trend play out yet again in IMAX's most recent quarter. The company signed a record 162 new theater systems during the period, which was more than it sold in all of 2015. That allowed the company's backlog to grow substantially even though its installation total remains elevated. While IMAX's results will always be lumpy from quarter to quarter, as long as demand for the company's screens remains strong, I have high confidence that shareholders will benefit over the long term. While credit and debit cards have existed for decades, roughly 85% of global transactions still occur using cash or check. That number has been slowly moving lower over time, as consumers and merchants alike warm up to the idea of using electronic payments, which speaks volumes about the growth opportunity ahead for Visa (NYSE:V). What's brilliant about Visa's business is that the company earns a small commission for every transaction that occurs on its network. With trillions of dollars being processed on the company's network each year -- yes, trillions -- those small commission add up fast. This year, Visa is expected to pull in more than $17 billion in annual revenue, up double digits over the prior year. While the company's numbers are already incredible, it is not hard to see why they will continue to steadily march higher over time. After all, credit cards are secure and easy to use. Plus, the last time I checked, you can't pay for things online using cash. That's why I'm confident that Visa's long-term growth prospects remain intact, despite Tuesday's election results.